Chandigarh (IANS): Given the presence of a strong Punjabi community in Britain, a new deputy high commission (DHC) was opened in Chandigarh on Wednesday. The DHC was inaugurated by British Foreign Minister Philip Hammond. “We’re determined to invest in our strategic partnerships around the world to boost cultural and commercial links and promote shared security interests,” Hammond said in his address at the inaugural event. Britain has its high commission in Delhi and deputy high commissions in Ahmedabad, Bangalore, Chennai, Hyderabad, Kolkata and Mumbai. It also has a trade office in Pune and a tourist information office in Goa. 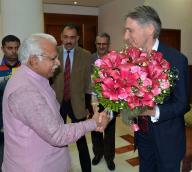 Hammond said that Britain and India had great scope to further strengthen ties on the trade and other fronts. “The fact that we are opening a new deputy high commission in Chandigarh speaks of our belief in India’s future. And it speaks of our desire to play a prominent partnership role with India’s states, where so much of India’s story is written,” he said.